When Derrick Rose spent his offseason on the USA Men’s National Team competing in the 2010 FIBA World Championships played in Turkey, he did so with two of the Oklahoma City Thunder as his teammates. Prior to Monday’s game, Kevin Durant, the tournament MVP who scored 28 points in Team USA’s gold medal winning game, said that he was among those who came away very impressed with what Rose brought to the table. “Unbelievable player,” Durant said of Rose. “I got the chance to be around Derrick for a month and a half, two months, and he’s just a phenomenal worker. He is a student of the game and has God-given talent, so quick and athletic. He uses that to his advantage. With the 2012 Summer Olympics in London less than 600 days away, the thought of joining forces once again with some of his teammates is something that has crossed Durant’s mind. With Westbrook and Rose, the connection runs a little deeper. The two share the same agency and have trained regularly in the offseason in Los Angeles the last few summers. When asked to describe those workouts, Westbrook used an interesting choice of words—silent. Just as Rose has taken another giant step forward this season, Westbrook has been equally as good for Oklahoma City. Though 21 games, he’s averaging 24.1 points, 8.7 assists, 5.6 rebounds and 2.2 steals. He’s also the current Western Conference Player of the Week for games played Nov. 29, through Dec. 5, having averaged 25.5 points, 10.0 assists 7.5 rebounds and 3.0 steals to help Oklahoma City to a 3-1 record. As for Rose, Westbrook knows the ins and outs of his game from countless summer workouts and sharing the backcourt on the USA National Men’s Team. So you could safely say he’s got a little bit of insight as to what makes the Chicago point guard so good. 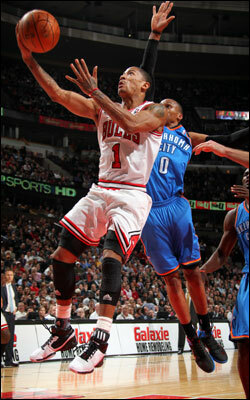 — Against Houston on Dec. 4, Derrick Rose had 30 points, 11 assists and a career-high five steals. Since 1973, when the NBA first began recording steals for individuals, the only other Bulls players with a 30/10/5 (points/assists/steals) game were Michael Jordan (four times in the regular season and four times in the playoffs) and Scottie Pippen (twice in the regular season/Elias Sports Bureau). — Joakim Noah is currently second in the league in rebounding with 12.2 rpg, while Derrick Rose ranks third in the NBA (first in the East) in scoring with 25.7 ppg and ninth in assists with 8.1 apg. — Derrick Rose is currently second in the NBA in Points + Rebounds + Assists with an average of 38.2. Rose is third in the NBA with 25.7 ppg, ninth in the league with 8.1 apg, and also averages 4.4 rpg. Russell Westbrook is first at 38.4. — The Bulls are 8-3 this season when they hold their opponents under 100 points. — Over their last 12 games, the Bulls have limited their opponent to just 98.9 ppg (1,187 points) and are 7-5 over that time. In the five games prior to that, Chicago allowed 102.1 ppg. — In his first two seasons in the NBA, Derrick Rose had scored 30 or more points in a game eight times. This year, Rose has already topped 30 points in seven contests. The Thunder took the first meeting this season in OKC 106-95 behind Kevin Durant (30 points and seven rebounds) and Russell Westbrook (28 points and 10 rebounds) … Derrick Rose posted 28 points and six assists for Chicago, while Joakim Noah posted a double-double with 18 points and 19 boards … last season, these two squads split the season series (1-1), with each team winning on the other’s home floor … Oklahoma City is currently on a two-game road winning streak against the Bulls at the UC … in the Thunder’s 98-85 win at Chicago on Jan. 4, Russell Westbrook led the way for the Thunder with 29 points, seven rebounds and six assists, while Kevin Durant posted 25 points and eight boards … Chicago got its revenge later that month by defeating the Thunder 96-86 (01/27), behind Derrick Rose’s 26 points and seven assists and Joakim Noah’s double-double (13 points and 11 rebounds) … the last time Chicago swept the season series (2-0) was during the 2007-08 season, it was the second time since the 1996-97 campaign, when the Thunder was still the Seattle SuperSonics … the Bulls are 8-13 in their last 21 meetings against Oklahoma City … in last season’s two games versus the Thunder, the Bulls averaged 90.5 ppg, while Oklahoma City posted 92.0 ppg … Derrick Rose averaged 22.5 ppg, 7.0 apg, 3.0 rpg and 1.00 spg against the Thunder last year, while Kevin Durant led the Thunder with 26.5 ppg, 9.5 rpg, 4.0 apg, and 1.50 spg against Chicago.